Tucci's Guide from Italy. Sent 17 Nov 2010. Finding this shop was a revelation. Out from the tourist paths, but not too far from the center, this coffeeshop hasn't anything: no sitting area (there is but it's closed), no fresh drinks, just a machine for cola and juices, no place to wait for your turn in the line (the shop is sooo small). But it definitely has one thing, the thing I'm looking for: the best weed, for the best value! Amsnesia at 10e/gram, SSHaze, Sleaze and Chocolope at 9e/gram, Jack Herer and Santa Maria at 7e/gram, and White Whidow at 6.5e/gram. The weed here is really well manicured, and it's always at its best! 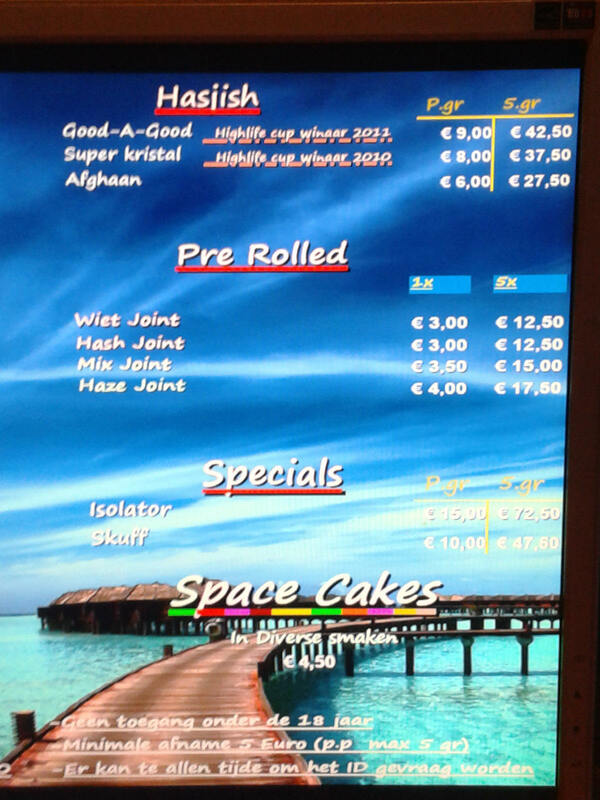 Here I tried the best WW of the whole Amsterdam in my opinion, and it's really cheap! And I'm not the only one saying so, take a look at the number of Highlife Cups they won. Strongly recommended to grab the best and go! Kees from Amsterdam. Sent 8 Nov 2010. For 15 Euros I got 1.6g when I should have got 2.3g. That's 0.7g underweight! I once travelled to this coffeeshop in the summer of 07. It hasn't changed much since then and today is April 2, 2010. Great atmosphere, great prices, and a terrific staff. The fact that it is off the beaten path should excite any fellow traveller looking for locals, who might not speak English perfectly, but will be some of the friendliest people you'll ever meet, I highly recommend coming out of your way, it will be well worth it. Mr Jim from UK. Sent 5 May 2008. A very nice, clean place with friendly staff (two ladies the morning I was there). Coffee is just coffee (nothing special), good menu with average selection, ranging from €6-12 per gram (pre-weighed). Nice, quiet neighbourhood shop with internet, board games and tropical fish. Definitely worth a visit if in the area.